New Zealand mobile advertising sales agency, Mobile Embrace’s 4th Screen Advertising, has created a media mobile game to promote the release of Kiwi film The Dead Lands for Transmission Films. The creative features an immersive rich media gaming ad unit initiated from the banner ad. Using 3D rendering, the mobile game brings to life the film’s central characters and the world of Maori warriors to create an interactive and adrenalin pumping gaming experience. Cindy Leong, spokesperson at Mobile Embrace’s 4th Screen Advertising New Zealand, says, “We were approached by Trigger Marketing to develop an interactive campaign to generate excitement around the film’s release. By creating something engaging and fun, the mobile game offers audiences an entertaining ad format that is highly impactful and ignites user interest to see the film. To play the game, users ‘tap’ the animated banner ad and are instantly prompted to ‘swipe’ their character left and right across the screen to avoid warriors and collect weapons to succeed. 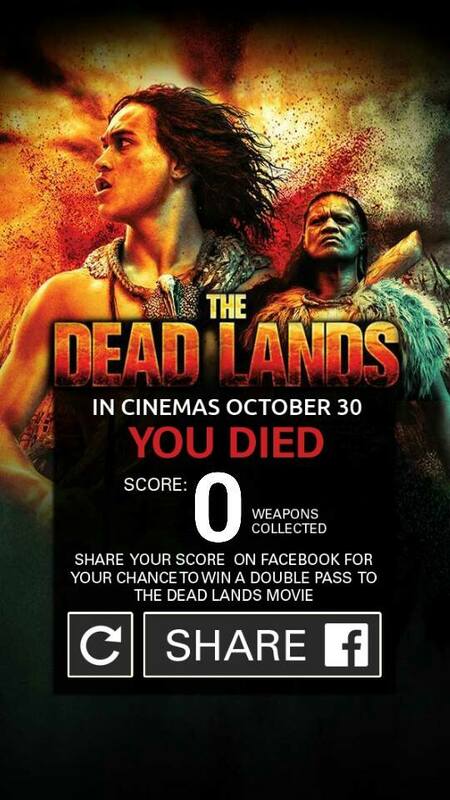 Once the user completes the game, they’re given their score and are invited to share this on Facebook for a chance to win a double pass to see the film. “Mobile is one of the most personal and engaging mediums. Research by our technology partner Opera Media Works for instance, reveals mobile ad content worldwide generated more than 64 billion monthly ad impressions in quarter two 2014, and reached more than 500 million global consumers. This campaign demonstrates how brands can connect with their target audience in a captivating and exciting way beyond the banner and on a device that they use the most,” said Leong. To ensure maximum contextual relevancy, the mobile campaign for The Dead Lands will be rolled-out across Mobile Embrace’s premium advertising network, including Rotten Tomatoes, Perform Group, Sportsmate, and The New Zealand Herald. The campaign will run from 16 October – 6 November 2014.